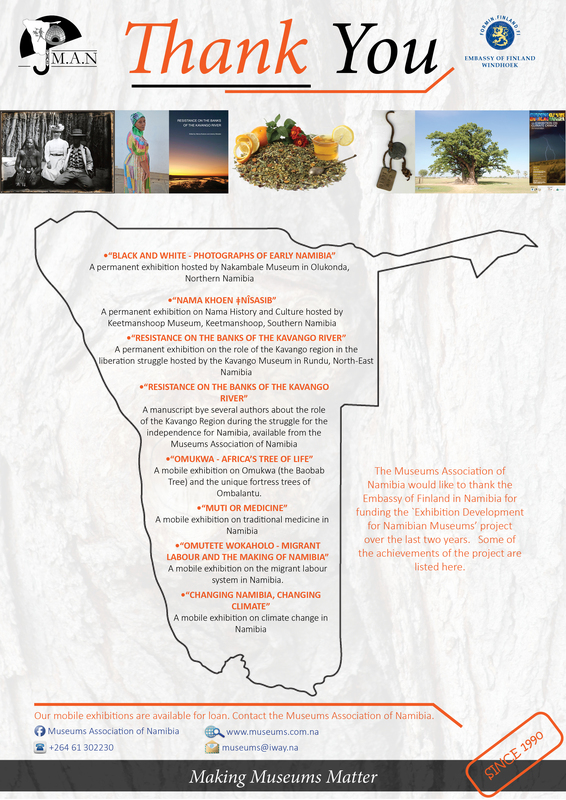 The Museums Association of Namibia (MAN) is an umbrella organisation that represents all Namibian museums. As a representative body it supports museums in various ways such as in the field of training, funding and the networking of professionals. 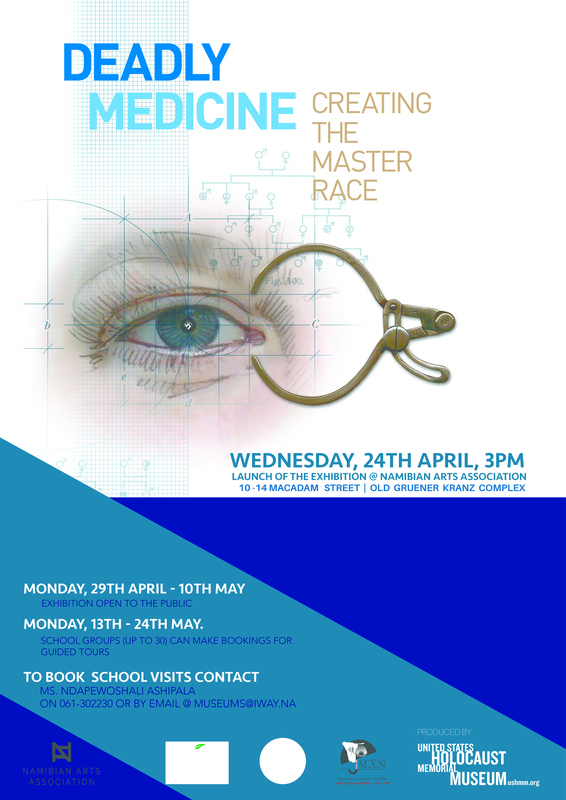 The media, teachers and members of the public are invited to the launch of Deadly Medicine: The Making of the Master Race exhibition. It has been developed by the United States Holocaust Memorial Museum, through the reproduction of Holocaust photographs and documents, films, and survivor testimony. The exhibition will be launched by Hon. Prof Peter Katjavivi, the Speaker of the National Assembly at 3pm on Wednesday, 24th April, 2019. The aim is to explore the Nazi regime’s “Science of Race” and its implications for medical ethics and social responsibility. The exhibition also challenges viewers to reflect on the present-day interest in genetic manipulation that promotes the possibility of human perfection. Therefore, the exhibition’s primary audience is both professionals and students in the medical, legal and history fields. This is an important educational exhibition which also suggests parallels with Namibian history and the use of racist science both during the German colonial period and under the apartheid occupation. The exhibition has been touring South Africa and is now in Namibia. The exhibition will be shown in Windhoek at the Gallery of the Namibian Arts Association (off Macadam Street, near the Namibian Book Market) and will then travel to Lüderitz. The exhibition is aimed at educating and challenging those in the fields of medicine and law to learn from the past and to critically review the policies guiding their work. The exhibition will also be a useful teaching and learning resource for senior secondary and university history students, as it provides a comparative perspective on the Holocaust which is one of the depth studies that learners studying history can select. 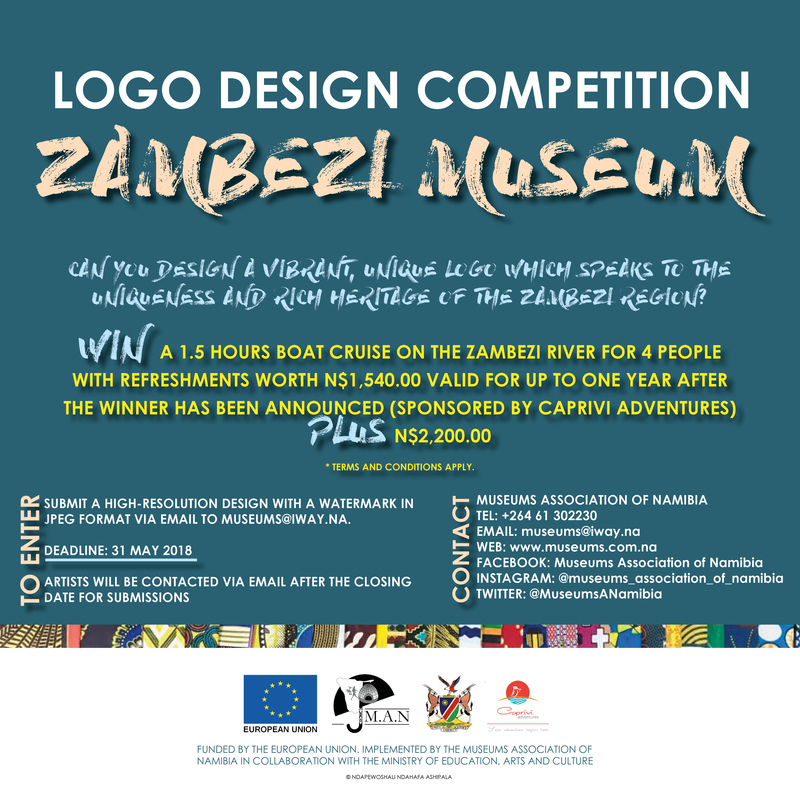 Schools are invited to contact the Museums Association of Namibia at or 061-302230 to book a guided tour of the exhibition (13th May to 7th June). Limited slots are available so please book well in advance. 1. 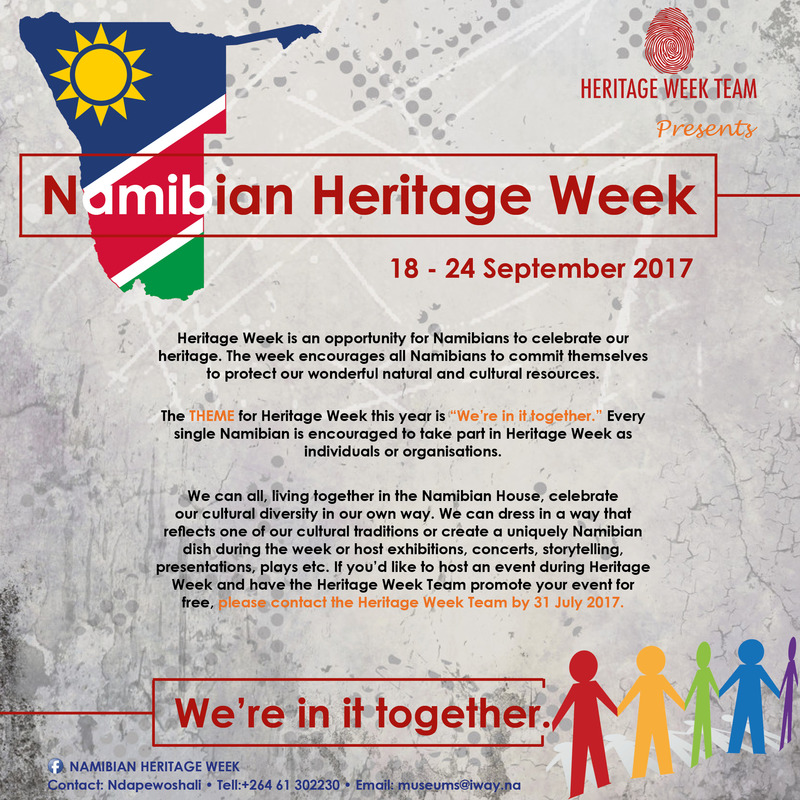 What is Namibian Heritage Week? 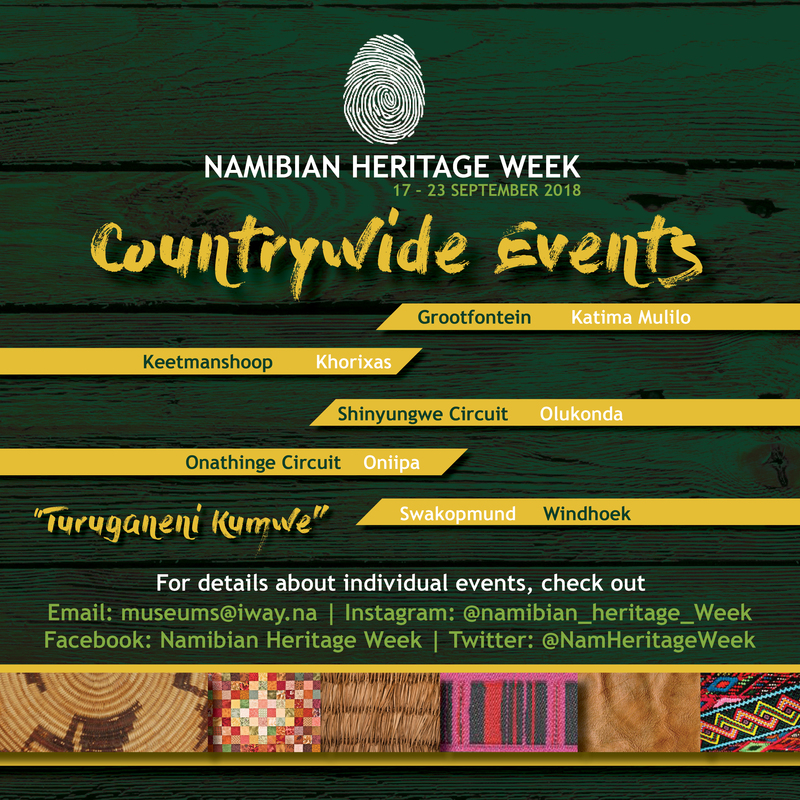 Heritage Week is an opportunity for Namibians to showcase our heritage. The week encourages all Namibians to celebrate and commit themselves to protect our wonderful natural and cultural resources. Namibia’s major heritage institutions have joined together as a team to organize Namibian Heritage Week. 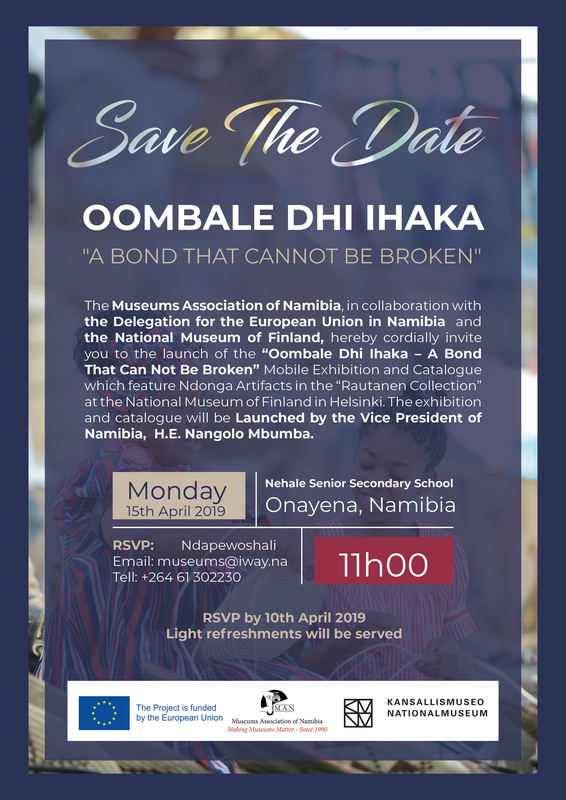 As an umbrella organisation for museums country wide, the Museums Association of Namibia (MAN) facilitates regional activities through its members during this week. 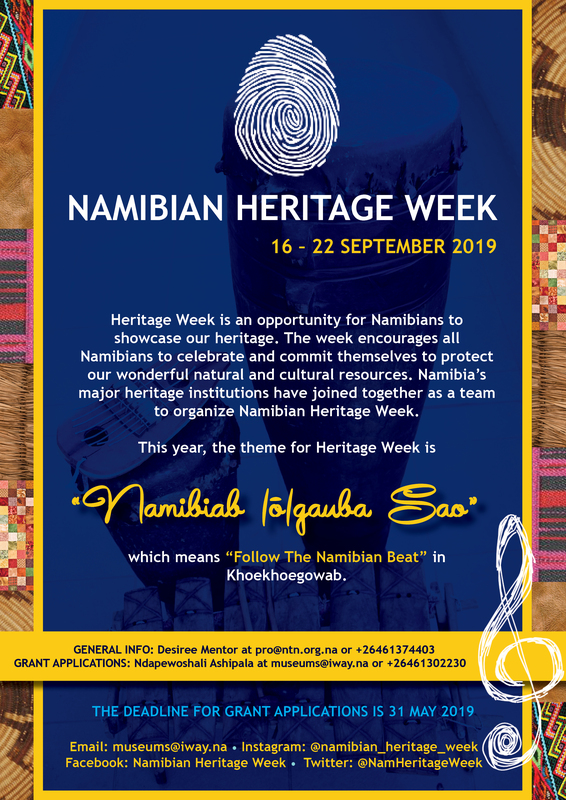 This year, the theme for Heritage Week is “Namibiab |ō|gauba Sao” which means “Follow the Namibian Beat” in KhoeKhoegowab. 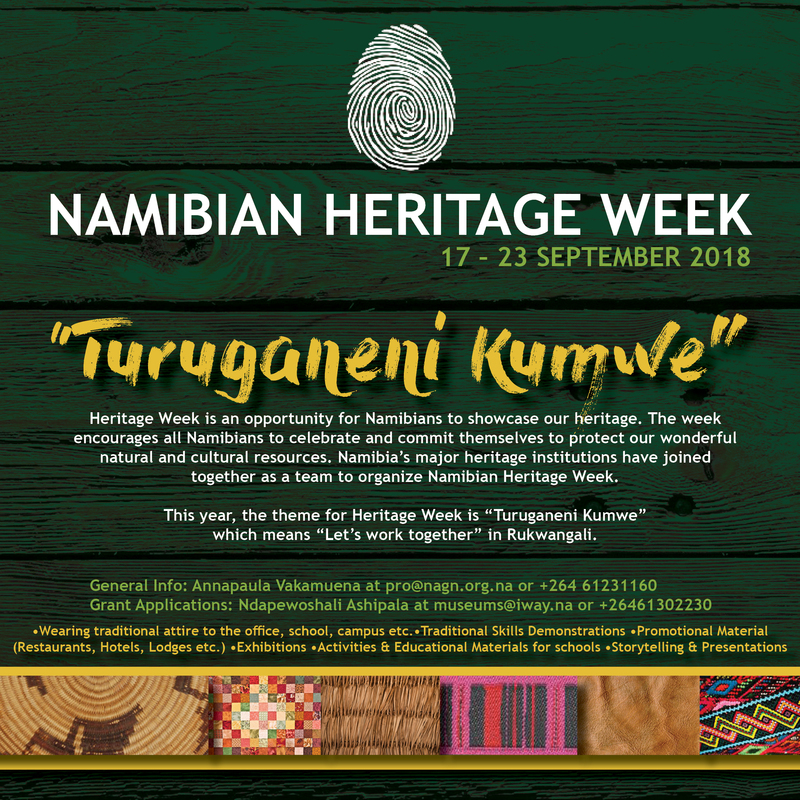 The Heritage Week Team decided that each year the theme for heritage week will use a local indigenous language as part of our commitment to promoting pride in our cultural diversity. 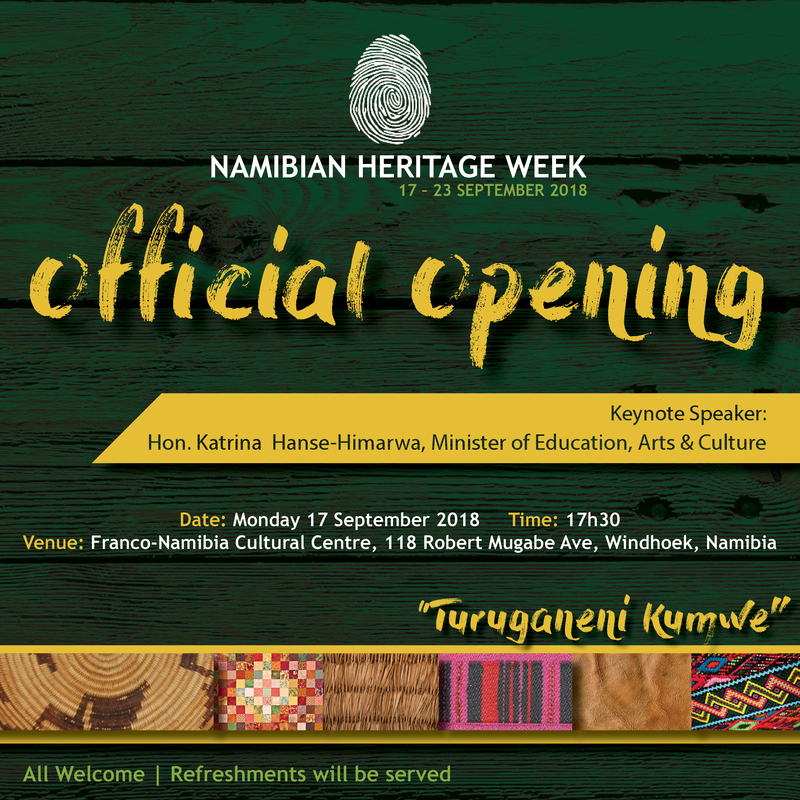 The planned activity should reflect the theme of Namibian Heritage Week. 2. What is the Heritage Week Fund? The Heritage Week Fund is available for MAN’s institutional and associate members who are interested in creating a programme of activities for Heritage Week. The maximum grant that can be awarded to each member is N$10,000. The grants are being provided this year with funding provided by the National Arts Council of Namibia. We encourage the co-ordination of activities within a region and encourage members to seek partnerships and additional sponsorship for their events. 3. Is your museum/organisation eligible for a Heritage Week Grant? 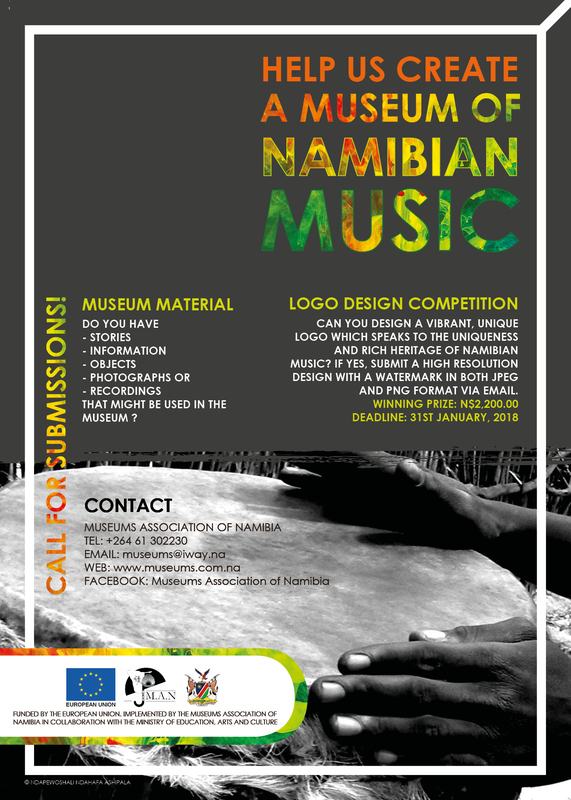 Applicants must be fully paid up Institutional or Associate members of the Museums Association of Namibia for the calendar year for which the application is made. Please note that grants are not available to individual members and that no funds will be paid into personal bank accounts. 4. What activities can be funded? 5. What are the grant conditions? 5.1 All grant applications must be typed. No handwritten applications will be accepted. 5.2 A museum/organisation should not have any outstanding reports pertaining to previous MAN grants received. 5.4 The MAN logo should appear on all promotional material produced for the week. 5.5 Successful grant applicants must submit a full narrative and financial report within two weeks of the end of Heritage Week. The financial report must include the original receipts to account for all expenditure. Any money which is not adequately accounted for must be returned to MAN. 5.6 In the event that Heritage Week Activities are cancelled, please inform the Operations Manager immediately and return any unspent funds. 7. How are grant applications assessed? Each grant application is assessed on its own merits and in the context of other applications, and against the Grant Assessment Criteria listed above. 8. When will we know if we are successful? 9. When are applications due? The deadline for grant applications is 31 May 2019 at midnight. No late applications will be considered. On Wednesday the 02nd January 2019, the Allgemeine Zeitung Newspaper published an article titled “Controversy over Colonial History – Museums Association demands an end to the alleged glorification of the past”. The Museum Association of Namibia (MAN) strongly refutes the non-factual information and derogatory allegations published in this article which seems intended to damage the good reputation of MAN. The article seems to refer to a report about a Conference on the `Past, Present and Future of Namibian Heritage’ that was organized by MAN in partnership with the University of Namibia and the University of Basel. However, the report was not written by the Museums Association of Namibia or any formal representative of the Museums Association of Namibia. The Museums Association of Namibia is not aware of the author or the origin of the report referred to. We can only assume that the report was authored by an individual(s) who attended the conference and reflects their personal response to the debates and discussions that took place. On Wednesday the 12th of September 2018, the Museums Association of Namibia sent out a press release to all the major media houses, including the Allgemeine Zeitung Newspaper titled “Press Release: The Past, Present and Future of Namibian Heritage Conference” which provided our official overview of the conference. 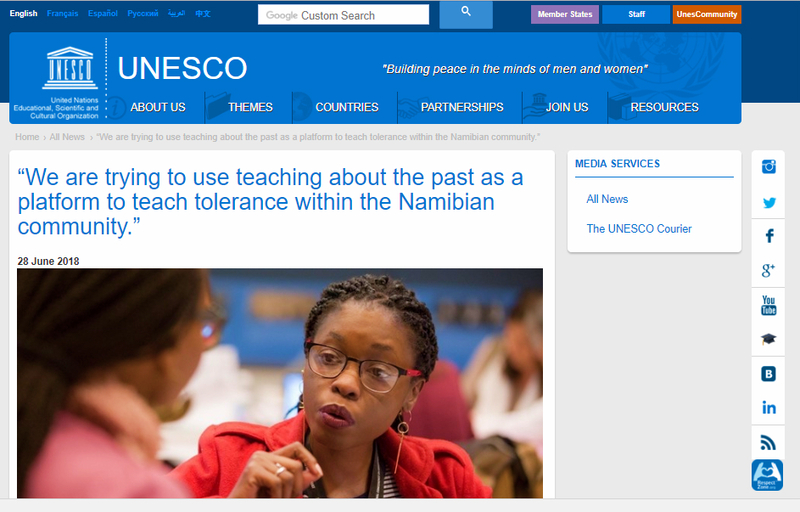 The same report titled “Thinking About Namibian Heritage” was also published on the 13th of September 2018 on the organisation’s website https://www.museums.com.na/. The article is currently the second most recent article on the homepage of the website. The article in the paper mentioned the website (indicating that the reporter did visit the website but failed to read the information about the Conference published there) which indicates a lack of professionalism. On what basis did the newspaper assume that the document in its possession was an official MAN report? Furthermore, the Museums Association of Namibia was closed for the festive season until Monday 7th January 2019 and therefore, no communication was made between the Allgemeine Zeitung Newspaper and the Museums Association of Namibia to verify its `facts’. If it had been, the Museums Association of Namibia would have categorically rejected all of the information published in the article as false. The Museums Association of Namibia herewith renders its extreme disappointment in this type of sensationalist, unprofessional journalism and therefore demands a written retraction and apology for the publishing of this article which is not only completely devoid of fact but is also slanderous and tarnishing to the reputation of the Museums Association of Namibia and its partner organisations which are also mentioned in the article. We remain strongly committed to the development of museums in Namibia and constructive debate about their role in our society. In anticipation of Namibian Heritage Week, the University of Namibia recently hosted a major three day Conference to consider `The Past, Present and Future of Namibian Heritage’. 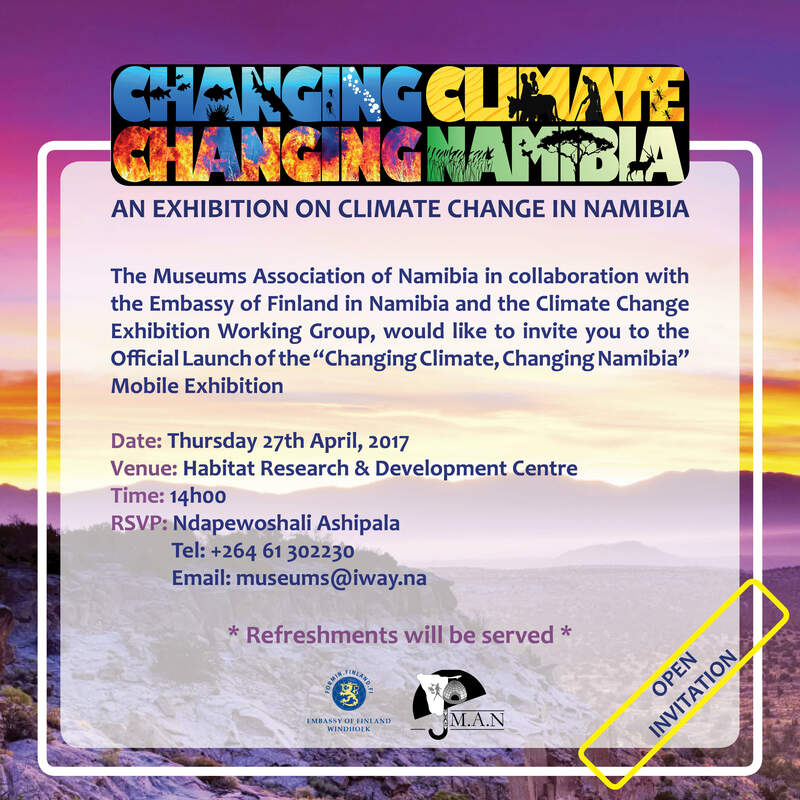 The Conference was organized in collaboration with the Museums Association of Namibia and the University of Basel of Switzerland. The Conference was divided into twelve sessions with the topics including the meaning of heritage in a Namibian context, the debate around collaboration and the possible repatriation of artifacts from collections abroad, the role of public art in contemporary society and the challenges to providing suitable training to support capacity-building in the heritage sector. The Conference started with over a hundred participants being welcomed by Prof Frednard Gideon, the Pro Vice-Chancellor for Academic Affairs and Dr Bennett Kangumu, the Chairperson of the National Heritage Council of Namibia. Prof Gideon emphasized the fact that the Conference was one of the fruits of an official partnership that UNAM had forged with the University of Basel. He praised the Carl Schlettwein Stiftung (Foundation), the main sponsor of the Conference, for its consistent support for the development of Namibian research and noted that over fifty Namibians had already obtained postgraduate qualifications thanks to scholarships provided by the Foundation. Dr Kangumu argued that `cultural heritage’ should not be viewed as, simply, part of Namibia’s tourism package, but that it lies at the heart of economic development in Namibia. Dr Kangumu’s argument was later taken up in presentations by Mr Elliot Mowa and by Dr Angel Tordisillas who spoke about the ways in which the Oranjemund Shipwreck and the National Maritime Museum (being developed at Lüderitz) can be magnets for economic growth in the towns. The Conference involved a diverse range of contributors with 58 people participating in twelve panels and lots of time being provided for discussions from the floor. In addition to the presentation of forty papers, there was also a panel discussion on training and a book launch (of The Genocidal Gaze). The Conference was only advertised through the networks of the three organizing institutions, but generated tremendous interest. Whilst the original budget catered for ninety participants it was eventually stretched to enable 120 people to participate and Mr Diddy Muifi, the Conference Organiser (from the Museums Association of Namibia) said that he is sure that, if it had been possible, many more people would have attended. One of the central features of the Conference was that it encouraged the breaking of boundaries. Dr Sem Shikongo and PaPa Shikongeni opened the Conference with an appeal that the Conference should draw on traditional belief systems and not just be an intellectual exercise. They argued that drawing on African roots would help participants to `re-think’ their sense of identity. Axaro Thaniseb spoke about the way in which the Government’s new Arts, Culture and Heritage Policy had been developed through a consultative process. Catherine Cole, the Secretary-General of the Commonwealth Association of Museums introduced the discussion of the ways in which museums, whose collections were often entangled with colonial history, could be refashioned for the twenty-first century. The theme was taken up in the second session which included discussion about the statue of the Curt von Françoise in Windhoek, the Swakopmund Museum, the `Witbooi Bible’ in the Linden Museum in Stuttgart and the ways in which art might be used to ask new questions about museum collections. 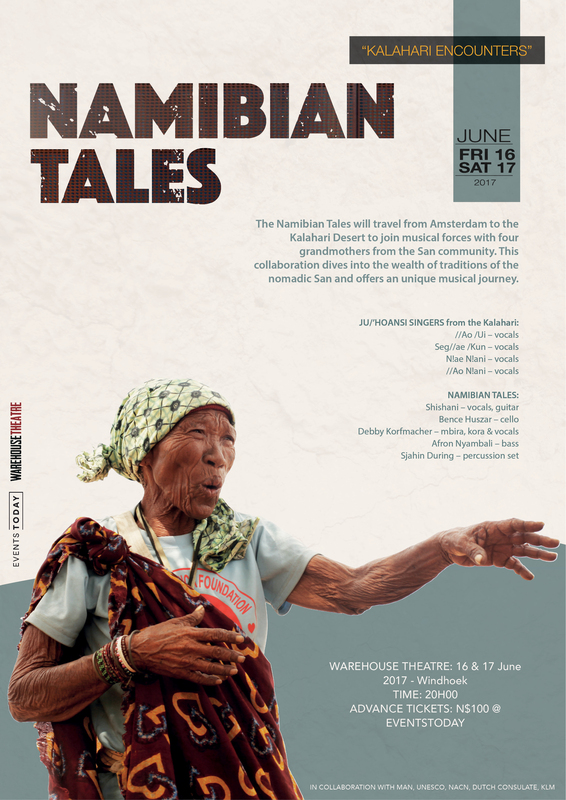 Issues about the ways in which, what was termed as the `Namibian Diaspora’. Discussions about the ways in which Namibian museums and communities might engage in dialogue with collections in museums and archives abroad was developed in presentations dealing with collections in Berlin, Bremen, Frankfurt in Germany, Basel and Berne in Switzerland and Vienna in Austria. The engagement with cultural heritage covered a wide range of topics. For example, Hertha Bukasa, the Culture Officer for Otjozondjupa Region spoke about the skills in making the traditional `Herero dress’, whilst Moses Mberiria gave a presentation on the significance of hairstyles. Ms Lovisa Nampala and Ms Nehoa Kautondokwa made an appeal for the preservation of the Oompampa (traditional graves) of the Aakwaniilwa (Kings) of the Ovambo Kingdoms of the north, using the Kingdom of Ondonga as an example. 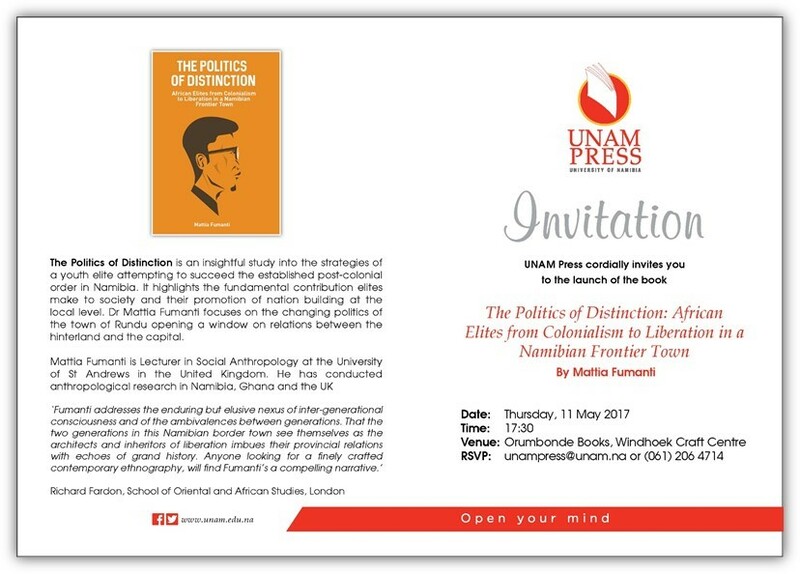 An important fringe event to the Conference was provided by Dr Marion Wallace, the author of `The History of Namibia’ and a member of the editorial board of the Journal of Southern African Studies. She provided UNAM staff and other local researchers with advice and tips on how to get published in academic journals. The Conference also sought to break barriers by engaging the Namibian art sector with the museum community. Presenters supported the idea of the Museum of Namibian Music as a way of discussing, celebrating and preserving our `intangible’ musical heritage. For example, there was a presentation by Ms Welhemina Suro Ganuses and Dr Sian Sullivan about the fading tradition of flute music amongst the community of Sesfontein. 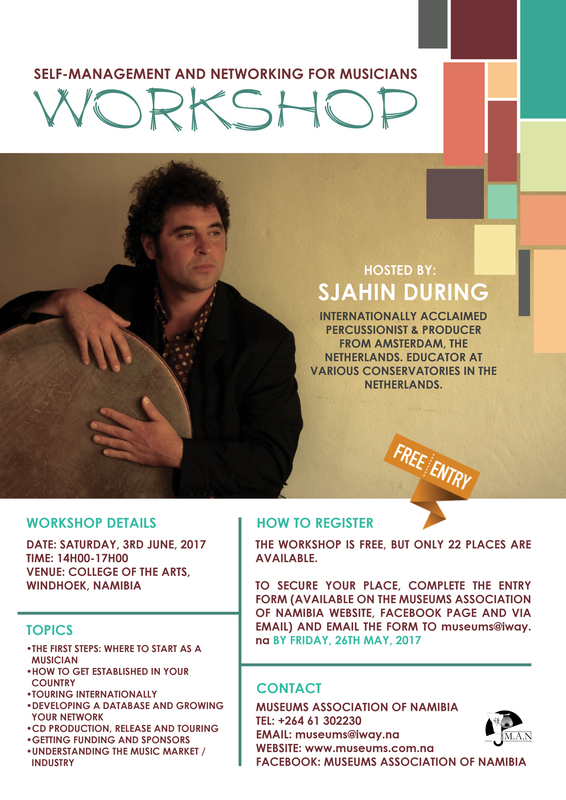 Whilst `Baby’ Doeseb spoke about the cultural influence of South African music on Namibian popular music. Dialogue between the participants was the core aim of the Conference and a braai organized by UNAM history students provided a great opportunity for this. Participants were also entertained by a stunning performance of capoeira dancing (the roots of which lie in the `play fighting’ traditionally performed by communities in northern Namibia and southern Angola. In the final panel Ms Nashilongweshipwe Mushaandja performed a powerful and passionate speech that accused museums and heritage institutions of being instruments of oppression. He, metaphorically, argued that museums should be blown up to create a space for new forms of cultural expression that would be more tolerant of diversity and freedom of speech. Ms Ndeenda Shivute demonstrated the way in which public art can be used to stimulate public debate about contemporary issues, whilst Ms Nikhita Winkler argued for the importance of dance and culture in society. The Conference closed with a bang, not a whimper, and left the participants buzzing with energy and inspired to continue their engagement with the heritage sector with its multiple possibilities. Click here to read the full interview on the UNESCO website. An interview with Ndapewoshali Ashipala on education about the Holocaust and genocide in Namibia. This year, the theme for Heritage Week is “Tu Ruganeni Kumwe” which means “Let’s work together” in Rukwangali. The Heritage Week Team decided that each year the theme for heritage week will use a local indigenous language as part of our commitment to promoting pride in our cultural diversity. The planned activity should reflect the theme of Namibian Heritage Week. The deadline for applications is 15 July 2015 at midnight. No late applications will be considered. Archaeologists have been excavating ancient human settlements in Africa for many years. Archaeological research has helped build our knowledge of pre-colonial Africa based on the objects that have been uncovered. The excavations also involved the removal of human remains from ancient graves and the study of these skeletons has given insight into subjects such as the diet of these ancestors and the cause of their death. However, in the early colonial period, some museums also sought human remains as `specimens’ of racial types that contributed to theories of racial hierarchies and the construction of racial stereotypes. Bodies were often obtained in an unethical way with bodies removed from recent graves (or even before they were buried) without the consent of their family. The University of Namibia recently hosted a workshop that bought together museum workers, academics and community activists to discuss a regional approach to the sensitive issue of human remains in museum collections. The workshop was funded by the Commonwealth Association of Museums (CAM) and the International Council of Museums (ICOM). 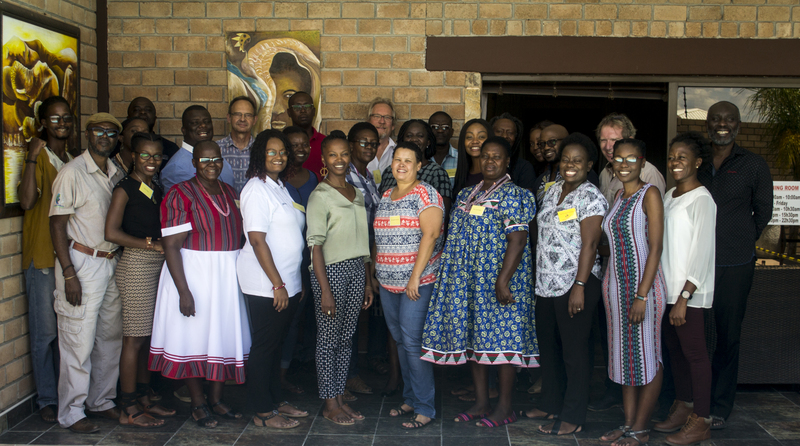 The workshop provided an opportunity to start a `conversation’ in Southern Africa about the best way to develop guidelines. It was argued that it was important that people who had been `collected’ as `specimens’ were `rehumanised’ so that their bodies are treated with dignity and respect. The workshop was particularly timely as IZIKO Museums of South Africa have identified almost 160 `unethically’ collected human remains, the majority of which were collected from Namibia. The collection reflects a particular focus on obtaining bodies from the San and Nama communities as, in the late nineteenth and early twentieth century, it was believed that these communities would become `extinct’. However the collection also includes a significant number of human remains from northern Namibia that were collected after Ondjala yekomba (`the famine that swept’) of 1914-1916. European museums are also reviewing their collections and have already started returning human remains. The most prominent recent examples have been the return of fifty-five individuals from German museums to Namibia in 2011 and 2014 and the reburial of Koos and Trooi Pienaar in South Africa in 2012 following the return of their bodies from the Museum of Natural History in Vienna, Austria. Ms Veno Kauaria, the Deputy Permanent Secretary of the Ministry of Education, Arts and Culture, who officially opened the workshop, set the tone for discussions by raising some important questions. “How do we decide whether human remains in our collection were obtained ethically? How do we find out whose human remains are in our museums, how old they are and how they got there? What should be the time period after which human remains can be legitimately excavated for research purposes . . . 150 years? 200 years? 1,000 years? When, if ever, might it be justified to display human remains in our museums? Dr Rudo Sithole, the Secretary-General of the African Council of Museums provided the keynote address and highlighted the fact that it would be useful if museums in Africa could collaborate to develop appropriate guidelines to deal with the issue. The current project is developing tools to help facilitate this conversation, particularly in Southern Africa. 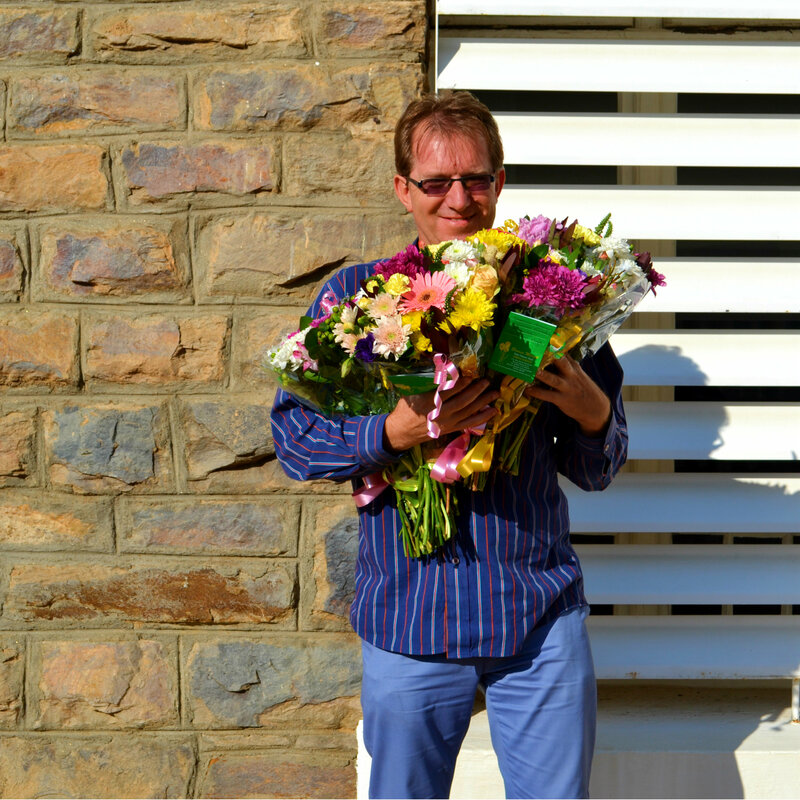 CAM provided funding to place a Canadian intern, Ms Paige Linner, with the Museums Association of Namibia for six months. Ms Linner assisted with the development of a small mobile exhibition that will be used as an educational tool by UNAM and that could be used to help facilitate community consultations. Additionally the project has set up a web site, www.humanremainsinsouthernafrica.org, that will be used to share relevant guidelines and policies as well as readings and educational materials and that will expand with the project. 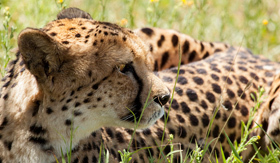 It is proposed that a further workshop should take place in Botswana in 2019. 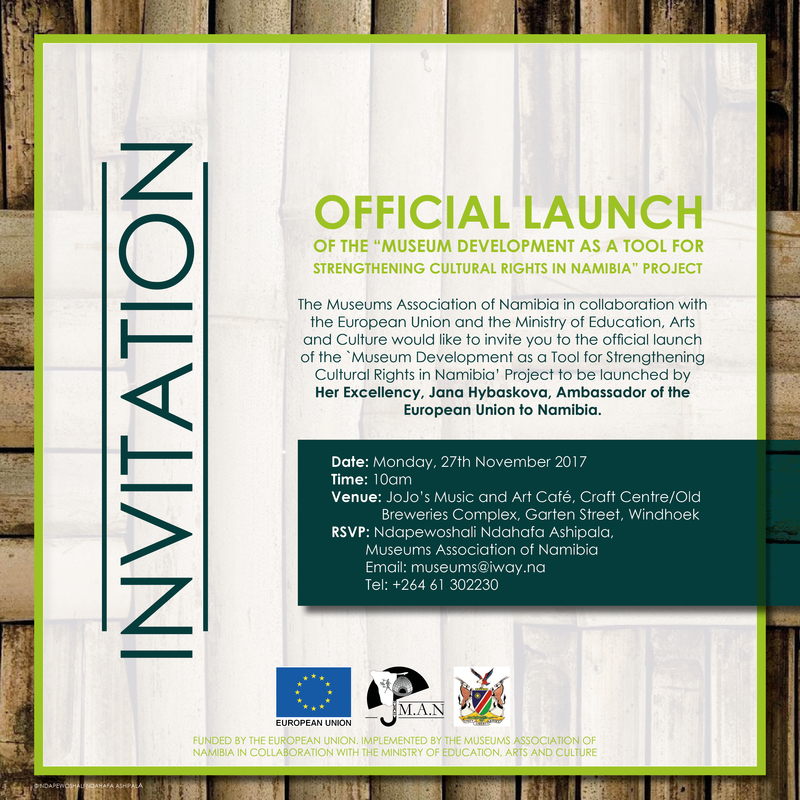 The Museums Association of Namibia in collaboration with the European Union and the Ministry of Education, Arts and Culture would like to invite you to the official launch of the `Museum Development as a Tool for Strengthening Cultural Rights in Namibia’ Project to be launched by Her Excellency, Jana Hybaskova, Ambassador of the European Union to Namibia.